EduSolution is a software that aids in quick and easy transfer of technique, skills, and operations. 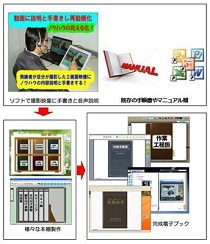 It can create a video manual for skill transfer easier than with existing tools,and create an electronic book from an existing procedure book or manual.Also copy/paste a created video onto anywhere as necessary.It is divided as a bookshelf form and managed with hierarchical structure.Create video manuals where users select and read documents among many video procedure books as necessary.Created files can be read via normal web browser and via CD/DVD. It is utilized effectively for skill transfers within a company, e-learning, product operations manual, customer support, etc. It connects distant work sites via the Internet (wireless LAN enabled),And enables technological assistance in a distant place in real time to share all applications including a live video, a document, or drawing.Not only is it possible to share data, but bidirectional handwritten markings are possible on a live video and on other applications .At the same time, it is possible to hold conversations with a distantly located partner through connecting PC and microphone All these functions are available even in an environment with a limited line speed (1Mbps). Simultaneous instruction to multiple bases is possible too. 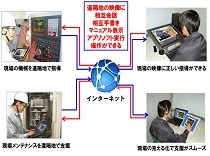 A common communication tool that uses the Internet is a TV teleconference system, however,our product is developed as a tool for smooth communication on manufacturing sites, construction and civil engineering sites, and medical sites in a distant place. 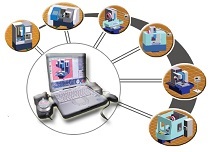 PRO-CNC is a simulation software that can realistically train an operation method and processing technique of the CNC lathe and machining center.General perception of "Machine Simulation Software" is of a simple system which is included with CAD/CAM.However this PRO-CNC enables learning of operation, configuration, and driving of the machines in the virtual world that simulates real machines by real movement.